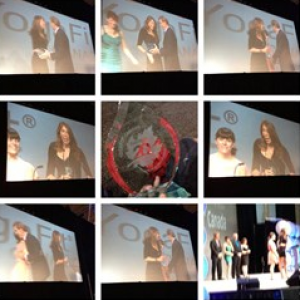 YogaFit Canada was announced as the 2013 recipient of the Steve Block Vendor of the Year Award this past weekend at canfitpro Toronto. canfitpro is the "biggest weekend in the fitness industry" and took place August 16th-18th in Toronto, ON. On August 16th, YogaFit Canada was proudly awarded the Steve Block Vendor of the Year Award at one of North America's largest professional and consumer based fitness shows, the Toronto canfitpro international fitness and club business conference. canfitpro is celebrating 20 years in 2013, which made this occasion especially memorable for YogaFit Founder Beth Shaw, and the YogaFit Canada Team, led by Director Lisa Greenbaum along with the numerous business owners, fitness presenters, personal trainers, group fitness, and yoga instructors in attendance at this huge industry-wide event. The Steve Block Vendor of the Year Award is given out annually at canfitpro's opening ceremonies. This year, Jillian Michaels lead the keynote address, speaking to the thousands of attendees about unlocking their unlimited potential, leading way to the awards where YogaFit Canada received highest honors. YogaFit Canada Director Lisa Greenbaum noted of the award "It is an absolute honor to be recognized for our hard work at YogaFit Canada! We have come a long way in three years! This is proof that when you follow your heart and believe in your wildest dreams anything can happen!" You can wish YogaFit Canada congratulations and take a class at their studio, located at: 898 Danforth Ave, Toronto, ON M4J1L9! YogaFit® is a fitness inspired Yoga program created by Beth Shaw. Designed to improve health, performance, and mental acuity, this program is based on the fusion of eastern traditional hatha yoga and western fitness science, blending balance, strength, flexibility and power in a fitness format. YogaFit® overcomes the mystery of yoga by delivering a practical, user-friendly style, which is accessible, understandable, and doable by individuals at any level of fitness. The YogaFit® Essence encourages us to be in the moment, to let the poses fit to our own bodies and to let go of any judgment, expectations and competition. The YogaFit® style reduces the risk of injury and augments recovery for ailments including stress, lower back pain and tension. YogaFit Canada is the preferred yoga-training partner of canfitpro. For more information on YogaFit Canada please visit YogaFitCanada.com.